Is there one rule for judges, another for MPs? New Delhi: Earlier this week, the Congress-led United Progressive Alliance was forced to defer the introduction of the judges’ assets Bill in the Rajya Sabha after rival parties, even some Congressmen, opposed it because it entitles judges to keep information about their wealth out of the public realm. It emerges that information on the net worth or wealth of the country’s elected representatives is also termed “confidential" according to Indian law. This, despite a sunshine law that requires everyone contesting an election to declare their wealth. Rules on the declaration of assets and liabilities by members of the Lok Sabha (framed by the Speaker in exercise of the powers conferred upon him by sub-section (3) of section 75 A of the Representation of the People Act, 1951), clearly state that while every elected candidate shall furnish details of his assets and liabilities within 90 days of taking oath, and would be maintained in a register, the “information contained in the register shall be treated as confidential and it shall not be made available to any person except with the written permission of the Speaker." “What is the secrecy that you are trying to maintain by giving the power to the Speaker? There certainly is justification for making this information public," Krishnamurthy said. The judges’ assets Bill was opposed by members of Parliament (or MPs) because it effectively exempts judges from disclosing their wealth. “There is a distinction between information of assets and liabilities of candidates contesting elections and that of MPs. As far as the former is concerned, it is in the public domain. But for MPs, the rules continue to apply. At present, till the matter is taken up by the CIC (Central Information Commission) and it rules otherwise, the Speaker has the discretion to decide whether the information should be made public," said Subhash Kashyap, former secretary general of the Lok Sabha and constitutional adviser to the government of India. There’s also the possibility of MPs’ wealth increasing significantly while they are in office and the current laws make no effort to disclose it in the public domain. Interestingly, while it is a 2002 ruling by the Supreme Court that paved the way for publicizing assets of candidates contesting elections, it was only in 2004 that the rules made the disclosure of wealth by MPs compulsory and adjudged it confidential. The enactment of the Right to Information or RTI Act in October 2005—this gives citizens of India the right to secure access to information under the control of public authorities—made the situation more complex. The CIC, meanwhile, referred one such RTI application to former Lok Sabha speaker Somnath Chatterjee (speaker between 2004 and May 2009), acknowledging Lok Sabha rules that say information on MPs’ wealth can be made public only after the Speaker’s nod. Chatterjee issued an order asking the designated staff to make the information public. While that sets a precedent, the decision in each case is “entirely up to the Speaker," said Kashyap. “He can decide not to allow it (the sharing of information.)." 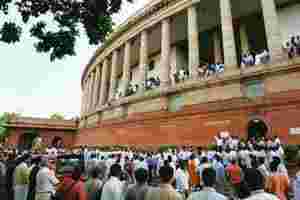 The rules for Rajya Sabha MPs, meanwhile, are slightly different. The rules (Declaration of Assets and Liabilities Rules, 2004) state that MPs should declare their assets and liabilities to the Speaker within 90 days of taking oath and this information “shall be made available to any person with written permission of the chairman". Unlike the Lok Sabha, rules for the upper house do not classify this information as “confidential". “The word confidential does make a difference because when it is used, it means the information would be disclosed only if there is an absolute need," said Krishnamurthy. Some activists, however, believe that the precedent set by the previous Speaker is enough to ensure future transparency as well. “Because of the precedent, the Speaker now would be hard-pressed to explain why the information cannot be disclosed. RTI does not apply to any information which violates the privileges of the House. It was believed that disclosure of this information would violate that privilege and hence the rule was inserted saying only the Speaker could allow it. But in light of the previous order (Chatterjee’s decision to make it public), it can be said that it does not violate Parliament’s privilege," said RTI activist Arvind Kejriwal. “But theoretically, yes, even now it is up to the Speaker." While the Bharatiya Janata Party’s Arun Jaitley said the “observation that the details of the MPs are kept secret is pointless" because candidates declare their wealth during the polls, Communist Party of India (Marxist) leader Sitaram Yechury said the rule that treats the information on MPs’ wealth as confidential is “tantamount to creating two classes of citizens, which is against the Constitution". Liz Mathew and Santosh K. Joy contributed to this story.